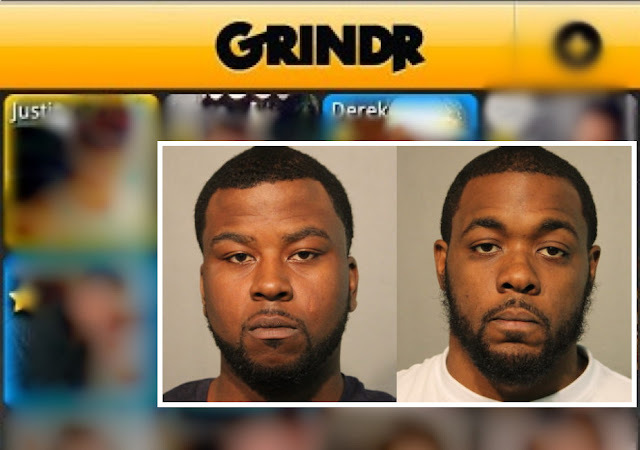 Jackson (left) and Kirkman lured at least nine victims into armed robberies using Grindr, police and a source said. Two men used the gay hook-up app Grindr to lure at least nine victims into armed robbery ambushes in Rogers Park since October 14, according to police and city sources. Police on Thursday set up a sting operation that led to the arrests and charging of the suspects. 25-year-old Stephen Jackson of Evanston and 28-year-old Trenell Kirkman of Blue Island were charged with a series of crimes and ordered held without bail Saturday afternoon. Jackson and Kirkman used the app to arrange meet-ups and draw men into a gangway in the 7600 block of North Bosworth where each victim was held at gunpoint and robbed, police said. Cops on Thursday afternoon conducted an undercover investigation that led to Jackson and Kirkman’s arrests in the same block of Bosworth, according to police. City records show seven armed robberies in the 7600 block of North Bosworth since the spree began: at 11:25 p.m. on October 14; 3:30 p.m. on October 15; 6:40 p.m. October 25; 6 a.m. on October 27; 10:30 a.m. and 12:15 p.m. on October 30; and 8:30 p.m. on November 3. Before the duo’s alleged robbery string, there had not been a robbery on that block since March 2013. Jackson is charged with three felony counts of armed robbery with a firearm, felony attempted armed robbery with a firearm, felony unlawful possession of a credit-debit card, and misdemeanor possession of a firearm with an expired ownership ID card. Kirkman is charged with four felony counts of armed robbery with a firearm, felony attempted armed robbery with a firearm and misdemeanor solicitation of a sexual act. State records show that Kirkman is on parole for narcotics.